But will the new campaign really encourage straphangers to give up their seats? Commutes are tough, no matter when you do it. But when you're pregnant, your feet are swollen, and that extra weight feels even heavier, getting around on a train or bus can feel like mission impossible. 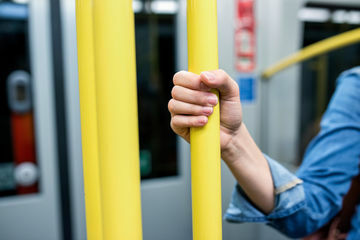 In an effort to give expecting moms the break they need (and deserve), New York City is offering badges for women to wear while they're commuting, encouraging other passengers to give up their seats. Two options are offered for this pilot program, running now through Labor Day: one says "Baby on Board!" while another one says "Please offer me a seat." The second phrasing is also available for the elderly or people who struggle with disabilities. "Pregnant riders, seniors and those with disabilities often need seats more than others but their condition may not always be visible. We hope this campaign will help their fellow riders to be more willing to offer them a seat without having to ask a personal question first," MTA interim executive director Ronnie Hakim said in a statement. "When I was pregnant with my daughter I was unmistakably pregnant. There is no way somebody could have glanced at me and not known. They hid in newspapers or pretended to sleep," New York mom Amy Oztan says. "Once, on a 90-degree day, I stood in the middle of a subway car and yelled 'Is anyone going to give me a seat or should I just pass out on the floor?' A button isn't going to keep people from being jerks. If they want to see, they see." Another NYC mom, Erin Howard, said she wouldn't opt in for the badge if she was pregnant again, especially since she found that younger generations were the least considerate, and she felt that adding a brightly-colored badge won't help the situation. In fact, she says it could make it worse: "Young people, teens and people most likely in their twenties, were the worst. It makes me sad that as a society we are so self-centered that we can't be polite enough to notice that a woman is pregnant and to then think she may need a seat. A badge like this further encourages us all to be less observant of others," she says. They might not be too off base, considering London rolled out a similar system in 2005, handing out more than 130,000 pins for pregnant women. Even so, many moms said they were ignored by fellow straphangers. Not all moms are anti-badge though. Mila Radulovic says she would wear a badge if she was faced with the opportunity again. Even if it might be a little band-aid on a bigger issue, at least bringing awareness to women who are pregnant (obviously or not), might inspire others to take note of people who could use a little extra consideration. What do you think? Would you wear it while commuting in hopes of getting a seat uptown?